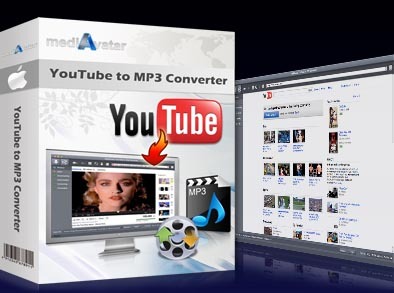 To extract music from YouTube videos and play everywhere via MP3 players, you should give a try of mediAvatar YouTube to MP3 Converter for Mac. Only one click to download YouTube to Mac and convert to MP3 audios. With the built-in browser in it, you can browse, search, watch, download and convert YouTube to MP3 speedily and conveniently. Additionally, this Mac YouTube to MP3 converter allows you to download and save YouTube video to Mac without converting or download and convert YouTube to WAV or MP2 audios. Plus, all YouTube to MP3 downloading and converting tasks are very easy to manage and control. Download and convert YouTube videos to MP3 in one step, support the latest YouTube update. Not only download YouTube to MP3 on Mac, but also download and convert YouTube videos to MP2 and WAV audios on Mac computer. Besides converting online YouTube videos to music, you can convert FLV and HD MP4 files on Mac to MP3, MP2 and WAV audios. Download and convert YouTube to MP3 on Mac via the built-in browser, proxy, or by dragging and dropping video URL directly to application or drop-zone. Launch mediAvatar YouTube to MP3 Converter for Mac, and use the built-in YouTube Video Browser to search, view, and download YouTube videos with ease. When browsing YouTube videos via Safari, you can directly drag the videos and drop to "Drop Zone" to download and convert the YouTube videos to Mac. It is supported to configure a proxy server for downloading videos from youtube.com. The YouTube to MP3 downloading/converting processes can be paused, stopped, restarted and deleted anytime as you like. Select a “Post-Task Action” (exit application, shut down, hibernate, stand by system) and the selected action will be automatically performed after conversion. This Mac YouTube to MP3 converter offers English, German, French, Spanish, Italian, and traditional Chinese for people worldwide. Download and convert YouTube/FLV Videos to various video formats and audio formats on Mac. Convert almost all video/audio formats into MP3, AMR, AMR (3G), M4R, M4A, OGG, WAV ringtones on Mac.